From Monday 18 to Wednesday 20 April, Fundación Telefónica Ecuador set up donation points in the cities of Quito, Guayaquil, and Cuenca to collect essential staples for those affected by the earthquake which shook Ecuador last Saturday. From the early morning, Telefónica Volunteers arrived with their donations which were channelled by Fundación Telefónica to the official collection points such as the District Office of MIES (Ministry for Social and Economic Inclusion) in Pichincha, Club de Leones Eugenio Espejo and the Azuay Prefecture, who transported the emergency supplies to the most badly-affected areas in the provinces of Esmeraldas and Manabí. As a result of this work, four tonnes of clothes, non-perishable food, toiletries, tents, blankets and equipment were collected. Also, the Telefónica Volunteers gave hours of their time in the various collection centres to sort and put together packs for families of four, according to reports from MIES and the Bicentenary Foundation. 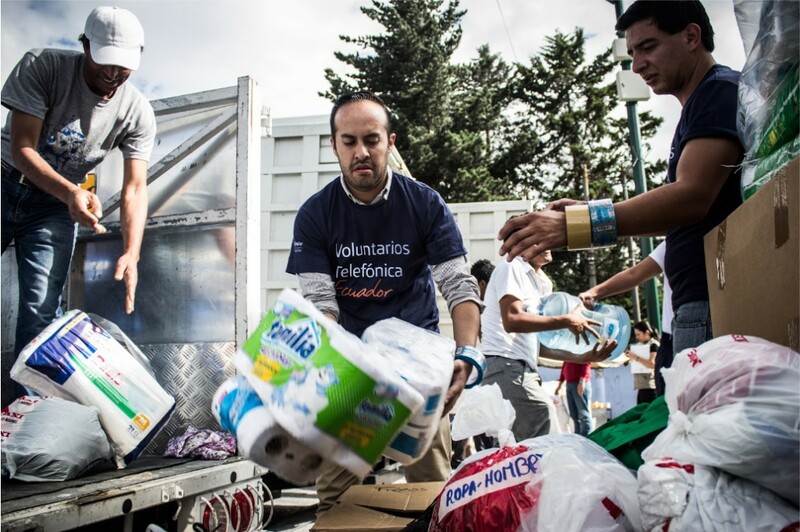 During the week following the earthquake, a total of 250 Telefónica Volunteers were involved in official relief efforts. Fundación Telefónica also took part in the housing initiative which came about through several architectural groups in the country, donating 793.6 m2 of billboard canvas which was delivered to the Ecuador Architects’ Association for the creation of camps in the affected areas. This voluntary work complemented the official institutional commitment through which Telefonica-Movistar offered immediate assistance to victims and from the outset worked tirelessly to restore basic services which were disrupted by the earthquake. During the week, Movistar made 35 vehicles available in the affected areas, thanks to which earthquake victims were able to make free calls and recharge their mobile phones, regardless of their service provider. Telefónica Group also sent 60 satellite phones and a plane with six experts to help with the rescue of victims. At present, Telefónica Group, working through Fundación Telefónica, is underlining its commitment to implement a plan for the medium and long term to benefit the affected families, organizing efforts in different fields such as education and corporate volunteering.